It was highly requested for me to write this post so here it is. These are my favorite skincare products I can´t live without. Once I get to Nova Gorica I will film a video answering all your acne-prone skin related question (including my Roaccutan experience), but for now I will only tell you about these products. I have tried many products, but after searching for a long time I found out there are only a couple of brands that can actually help acne-prone skin. 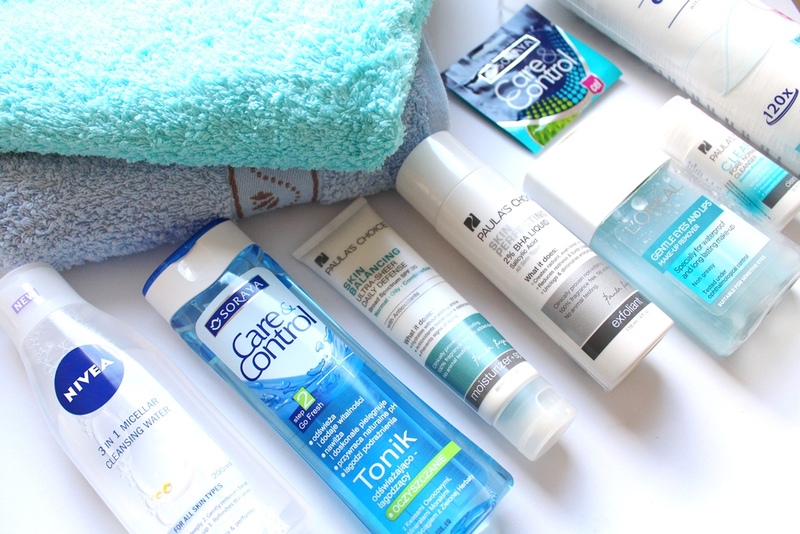 I talked about La Roche Posay before and it is still in my top 5 brands you should try, however my skin got really sensitive and it gets dry sometimes and I found out those product are a bit to harsh for me nowawdays. Before I start let me just state this review is not sponsored in any way and everything I say is 100% my opinion. I will start with my newest addition to my skincare routine. I think cleansing is the most important part in a skincare routine since it can (by itself) remove a lot of oil buildup and dirt from our everyday like. I use this Micellar Water to finish my cleansing routine. I have at least 3 steps every day. In the first I use the Paula´s choice product (I will talk about it in a minute), then I use an oil-based cleanser with my Olaz Regenerist Face Brush (which I think you should seriously invest in, since it does wonders to your skin and is a fraction of the Clarisonic´s face brush price) and I finish my routine with this Micellar Cleansing Water. I have tried a few Micellar Cleansing Waters before, but never really got the hype, since I did not see any special effects. I notice this brush really does take off whatever you have left on your skin (which is more than what you would think – and I cleanse my face twice before using it). It is great for all skin types and what I find most important – it is alcohol free. You should stay away from anything that has alcohol in it if you are fighting with those red marks left from your previous acne. You can get this product in your local drugstore and it is currently on sale in DM. I have talked about this brand before and it is still my second favorite brand – ever. I love their peeling (you can watch a tutorial on how you should use it – check out my Youtube channel) and their BB/CC creams are really being hyped right now. The two products I love (besides the peeling and their face creams) and have been using religiously are their Care & Control Tonic and their Care & Control face mask. The tonic really hydrates the skin and calms it down after all that cleansing and it prepares the skin for what you will be applying next. I never put much thought into my tonics and I even rarely used them. That is until I have tried this one. I was sent the first one for by the company, but purchased my second one just a week or so ago – and I am sure I will keep repurchasing it. Again, this product is alcohol free and thus it does not irritate your acne. The best for last. I can´t say enough good things about this company and I have already got my mom and some of my friend hooked on their products. As you know I have been struggling with acne my entire life and even had to resort to Roaccutan – a treatment know for having awful side effect that can damage your health. I got my acne back a couple of months ago after I stopped taking my birth-control pill (if you want, I can make a whole blog post about why I did it and why I think it is best to stay away from it). This time it was like I never did the Roaccutan treatment at all. I thought I would have to go and do it again. I refused to go out of the house without any makeup on and I even canceled my invitations to some blog events because I was too embarrassed. Trust me, I know how it feels. And then I tried a brand to which I will be forever thankful. Paula´s Choice. I think the number 1 product that saved my skin was/is the 2% BHA Liquid. From the beginning I applied this product 2 times a day and now I just apply it once a day. If I see any active acne I use their AHA exfoliate since it really drys up my acne fast and I sometimes use my LRP Effeclar Duo + cream over it to speed the process up. I have heard many times that this product only works for a week or two and then leaves the skin as it is. That is true. But only because people start adding other products to their routine that make the skin worse. It is like if you were working out and then after every workout went to McDonald’s. You would be stuck where you are and you wouldn´t loose weight. Now that I got that rant out of the way. I think Paula´s Choice product give me the results that my Roaccutan treatment did, without all the side effects. Next to their exfoliants I also use their Clear Pore Normalizing Cleanser which is effective enough to remove all the oil off my face while still gentle enough to be used even twice, or more times a day. Their Skin Balancing Ultra Sheer Daily Defense moisturizer with SPF 30 is great for getting in your moisturizer and SPF for the day (which you 100% need if you are using ANY KIND of acid on your face), however it can be a bit drying so I try to alternate between using this product (when I feel like my skin is a bit too greasy) and a moisturizer for dry skin and a sun screen protector (when my skin is feeling dry). The company tries to help their costumers and they even have their own Youtube channel where they do live chats and try to answer peoples questions about skin as well as recommendations. I think the company really cares about their costumers when they actually look what is good for you and even offers you some other brand´s products…and up to now I have only got that from Soraya (which suggested I should try Paula´s Choice) and them. They also have a beauty site/blog where they review high-end cosmetics and skincare and their are actually honest. They say when a product is the best on the market and they even tell you about the negative sides of their product. If I could only use one brand for the rest of my life it would 100% be Paula´s Choice. Yes, I know their products are a bit on the pricier side, but trust me when I say this. They are worth it. My skin is now the clearest it has been in the last 1/2 a year and it just keeps getting better..day by day. And please, before you start judging any product make sure you are not using something that is combating the products that are trying to help your skin. So far I have received many questions about how to get rid of blackheads; did I like my Roaccutan treatment; what concealer is the best for covering up acne etc. and I will answer them in a future post/video. Please leave any questions you may have bellow and I will try to answer them as soon as possible. I hope you found this post helpful and if you want any more tips on how to get clear skin, make sure you let me know. Jaz pa prisegam na Afroditine in Alkmenine izdelke, se mi je tudi ful popravila koža. S katerim izdelkom si torej najprej ocistis obraz preden si ga z cistilnim gelom PC? Ker po nastetih PC sem razumela, da je to 2%bha liquid al kateri?